Safco Tuff Truck Economy Platform Truck - GS Direct, Inc. Need a little extra Tuff around the office? The Tuff Truck™ Small Platform Truck is perfect for those smaller moving jobs. 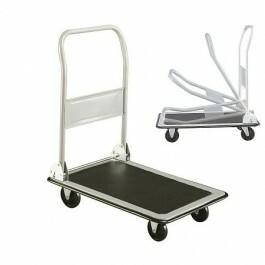 Whether it's heavy, awkward or too large for one person to carry this hand truck is the solution. Move boxes of literature or supplies easily to the mail room, break room or supply room. Keep boxes moving in the warehouse, storage area, assembly area, production area and receiving areas. Move trade show equipment with ease or move boxes of products from the storage area to the shelf! If it needs to be moved the hand truck will get it from point A to B.